The world has definitely changed -- and so too has the art of advertising in business. 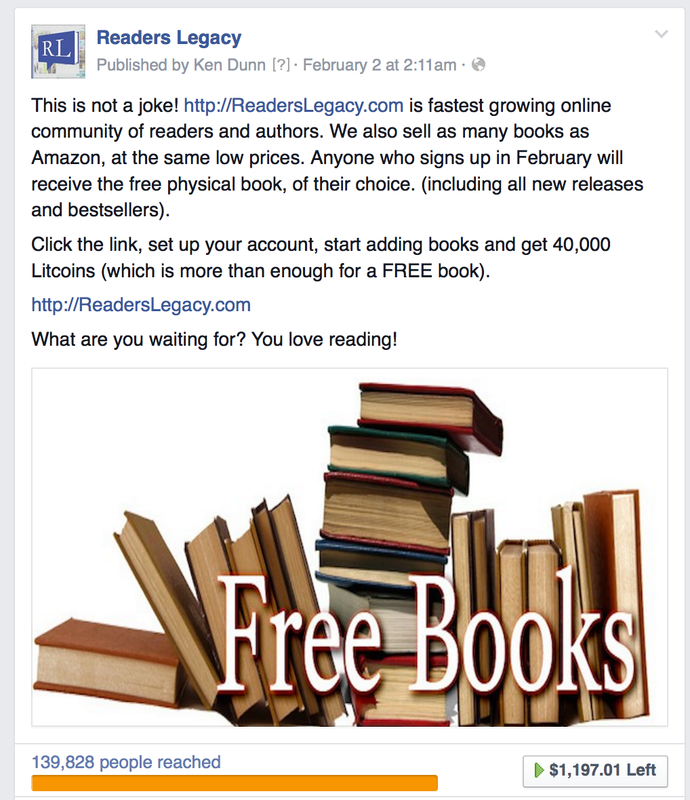 We pre-launched Reader’s Legacy six months ago but decided that it was time to start our publicity campaign on February 1. Over the past six months, we have had many discussions on where we will start spending our advertising dollars. We are still in the middle of a major fundraising campaign, but we knew that we had to start driving people, who loved to read, to our community. We also knew that Facebook advertising was going to be part of the plan, so I started studying the art of Facebook advertising four months ago. I decided to share the results of our first week to my tribe, as I know that there are thousands of us (entrepreneurs) out there who are trying to figure out how to bring new customers and users to our web properties. I think those results were very respectable -- and I learned a lot. I’ve even included screenshots to help you really understand what we learned. Here are four points that we learned in the past week. 1. Decide who your clients / users are, and market directly to them. Facebook gives you the ability to choose exactly who you want to advertise to. Take this very seriously. Do your own research to determine who your targets are. We decided that we were going to market to men and women in America and Canada between the ages of 35 and 60 who liked to read. All of our research told us that 75 percent of readers were women, but we decided to advertise to men and women in order to determine if the statistic on the female dominated space was correct. We choose these criteria very specifically. Our research told us that everyone is advertising on Facebook now, and that we would have to offer real value to catch our readers attention. We did the math and decided that we could afford to give each new user that joined a free Book. Yes, that’s right, a real physical book that we would ship to them. We sell over 16 million books and operate an affinity program (points program) where users can collect points (LitCoins) to buy books. So we decided to run a promotion for the months of February and March, whereby every new user would get enough LitCoins to buy a new book and, if they referred another user, they would get enough LitCoins for a second book. The credit for this idea has to go to PayPal. We learned that they gave every new user a $10 USD credit for creating an account. PayPal spent over 1 million dollars on this strategy -- and it worked. It worked for us too. In addition, we have seen one share on Facebook for every two likes. This is an amazing statistic. We never expected the shares to be so high. That means that people really wanted their friends to know about our offer.That is free advertising that you don’t have to pay Facebook for. I invested in one hour of coaching with one of the many Facebook advertising gurus. In my session, he told me that we had to catch people’s attention. That made sense to me. We decided to start our add text with the phrase, “this is not a joke”. My guru’s advice was that there are so many ads on Facebook now that you had to use some subtle “shock and awe." It appears that our opener worked. 4. Engage with your likes, comments and shares. With the remarkable 40 minutes per visit statistic that Facebook has, my guru told me that we needed to engaged with the people who responded to our add, because people live on Facebook. Facebook gives us the ability to invite anyone who likes our post to follow our business fan page. You just have to click on the number of likes and a whole list will appear. After the name, you will see the invite button. This is one of the reasons that Facebook advertising is such a premium. 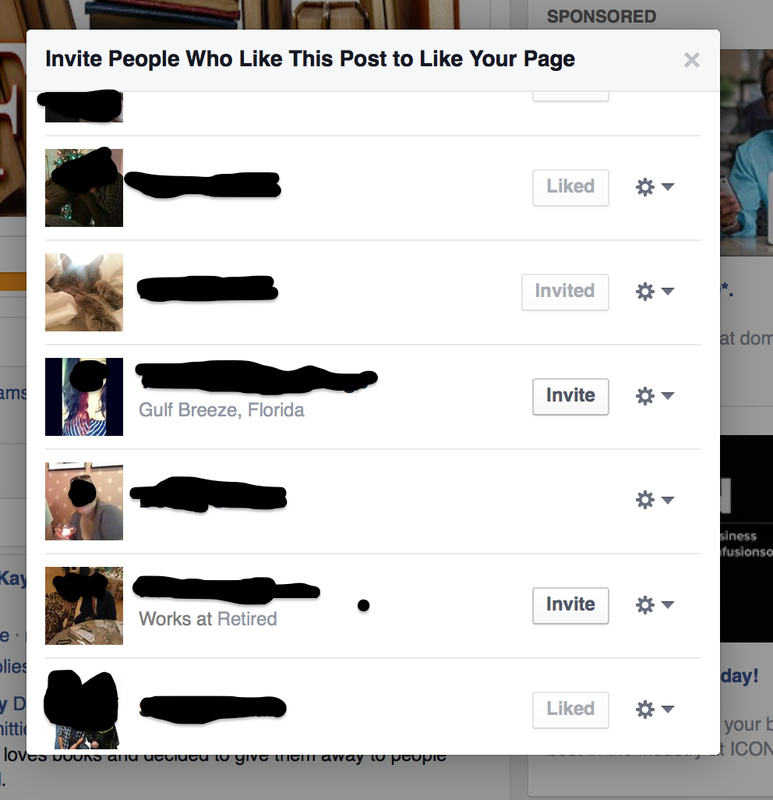 You are paying for the right to invite the likers to your page. It is important to do this as you can actually advertise to your fans at a lesser amount later -- so be sure to grow your fan base. We added 533 new followers to our business fan page this week. Also make sure to monitor the comments in your post. Our guru told us that, if the post was successful, the critics would come out. Boy, was he right. We had critics posted that it was a scam, that they could get free books elsewhere and that it was too good to be true. Instead of deleted the negative comments, we responded, clarified -- and it worked. We ended up with dozens of likes on every comment reply as well. Finally, we made sure to comment and like the shares. 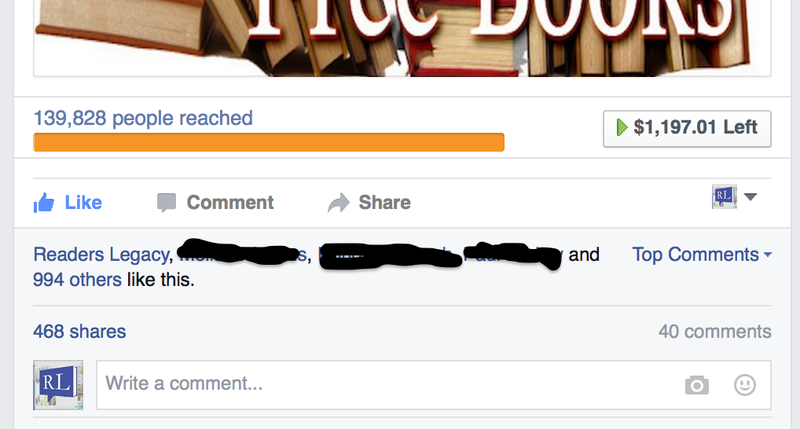 Facebook lets you click on the number of shares and a list of the shares will come up. 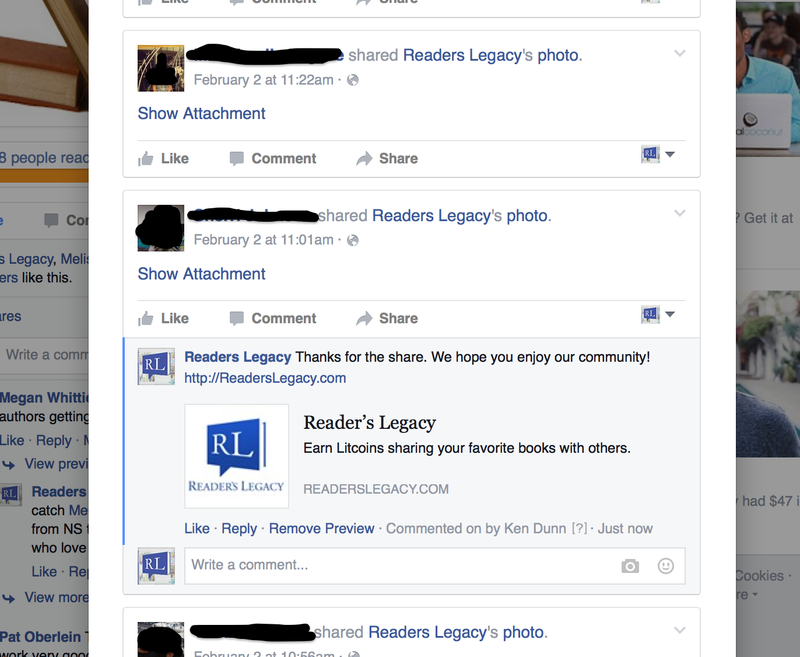 We started off making comments of thanks, such as: “Thanks for the share, we really hope you like http://ReadersLegacy.com." We wanted to use this as an opportunity to send yet another notification. Facebook didn’t like this too much, and they warned us of inappropriate use after about 150 comments, so we went to just liking the shares. Our first week of Facebook advertising was a success. We ended up with 800 new users on Reader’s Legacy. As we expected, 90 percent of the new users were women, despite advertising to both genders. In the future, we may be more specific and just advertise to the female gender. The Facebook ad yielded 623 of the new users. Remember, above I mentioned that we were also giving credits if our users referred their reading friends? Well, the 623 referred another 185 members, for a total 808 new members in the first seven days. We didn't have to pay Facebook for the extra 185 new users. We are really excited about where we are going with our community -- and this week of advertising was further proof. Our guru also told us that we could start with smaller, shorter add runs in order to test what we were doing. In the next weeks, we are going to start running multiple adds to different groups of people. We now have the necessary data to plan our run to 1,000 new users a day. I hope this analysis helps you to better use your own add dollars on Facebook. I do realize that most new entrepreneurs can't afford to give away a $20 book for every new user, but user this analysis to come up with your own value add give-away. We also committed $2,000 to our first two weeks, which is a lot for a new entrepreneur. Facebook advertising definitely needs to be part of any entrepreneurs advertising plans. I’m sure that our experience will help you to better spend your ad money.